They call it exercise; I call it riding my bike. Learn how to get the best fat burning experience you can get without taking a single step. Learn to maximize your results now. Whether you are someone who is trying to save money on gas or just looking to get more exercise daily, choosing to ride your bike to work or class everyday is a lifestyle choice that some of us are willing to make. For those doing it out of pure enjoyment, it is easy to forget to stop and think about it as exercise at times. Like any exercise there are caloric and aerobic aspects that need to be considered in detail. Turning exercise into a habit has many health benefits that go along with it. Aerobic activity continued over time can slim down your lower body and become the key to maintaining your health. In addition to helping you lose weight, it possibly help you relieve stress at times. Let's see how to make the best out of your bike routine, both physically and mentally. Next time you find yourself looking at a screen watching time go by in the gym spinning on an aerobike, trying to keep up with the bike hill climbing routine, remember there is an alternative. Get on a real bike and enjoy some fresh air. We all know that bike riding is both fun; but what is less obvious is that it is a highly effective fat burning exercise. Although everyone likes to peddle breathlessly to see how fast they can go, keeping up with the cars, getting an anaerobic exercise in the process; its better not to overexert your self and enjoy the ride. So, next time you find yourself out of breath, take some time to smile and enjoy the ride. One merit in choosing to ride you bike is that compared with other aerobic exercise is that it is easier on your knees and lumbar region. It is often recommended to those less involved in routine exercise. So, if you don't have a current workout plan, it's an easy alternative to getting a gym membership. Another merit in choosing to ride your bike is that compared to other aerobic activities it is easy to maintain your heart rate and you are less likely to overexert yourself. So if you are worried that by riding your bike to work or school is going to effect your day negatively out of exertion, don't worry. If any exercise is going to leave you with extra gas to get through the day, bike riding will. Along with proving a cost effective way to get around, bike riding can help you burn fat and train your thigh, abdomen, and gluteal muscles getting you in shape. There are some of us who are worried about our muscles bulking up as a result of this training. Rest assure, because this is not the case. Look athletes participating in cycling, such as Lance Armstrong. When he steps of his bike he looks doesn't resemble anything like a bus, just the greyhound. In particular, women are less likely to bulk up than men. With that said, it should be even less a concern for women. For those who have tried it and experienced increase muscle bulk, think about how you ride your bike. If you find yourself out of breath, getting too much of an anaerobic workout, you may want to bring it down a notch. 2. The fat burning effects of bike riding are affected by the way you ride? When trying to lose weight by bike riding, taking special care in your posture and the way you alternate your peddling is key. Let's look at ways to improve from here. Although many people may start peddling from the arch of their foot, it's recommended that you peddle from the front of your foot, near your toes, positioning your foot in the center of each pedal. This not only allows more work to be done through your calves, it makes directing work throughout your entire legs possible. It is not recommended that you wear sandals while riding using this method. Let's take special care in our posture when peddling. When tired its easy to develop slump in your back. We do this because it makes us feel like we are resting. Although you may think you need the rest, this is not helping you get stronger more defined abs. So next time you find yourself in this situation, stretch out your back. You don't have to squeeze, just hold while looking forward. 3. How about the gears, are they all the same? From time to time, you may want to go into high gear and appreciate more wind in your hair; however staying in lower easy to peddle gears is more effected in producing the fat burning effects you are looking for. So, how low do you go? Well, that's a good question. It's important to find a point that you are comfortable with, i.e. a gear that you are less likely to have trouble peddling at. While it is important pay attention to how you peddle and making sure your posture is upright while thinking about bike riding as a pillar in your diet, it's even more important that you ride safe. In addition to safety, enjoying yourself and not overdoing it can be the key to being able to continue your program. Overexerting ones self while trying to get to work or school is one thing; however, not being able to get though the day because of it is another. Let's see though that that doesn't happen to you. Take the easy route. It's better for you. 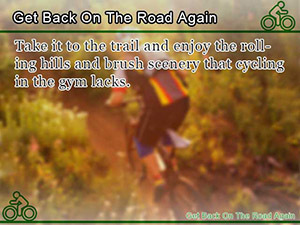 Take it to the trail and enjoy the rolling hills and brush scenery that cycling in the gym lacks. Time down fat throughout your entire body with aerobic exercise that is safe for your back. Tone your legs, build stronger abs, and switch gears smarter just by changing the way you peddle.